Hanover® Architectural Products has been providing quality concrete unit paving products to the architects and designers for over 35 years. The company is constantly striving to manufacture innovative types of pavers utilizing unique shapes, aggregate or color blends, and surface textures. It has earned a reputation of leadership within the industry based on our products performance and the support given to our customers. Hanover® has an extensive unit paver range and accessory products. Pavers for On-Grade Applications have the characteristics and the performance of natural stone, but can offer the project an economical alternative. Using extreme hydraulic pressure, Hanover® bonds crushed limestone and granite together, duplicating the forces of nature and producing a naturally beautiful Reconstructed Stone™ Paver. 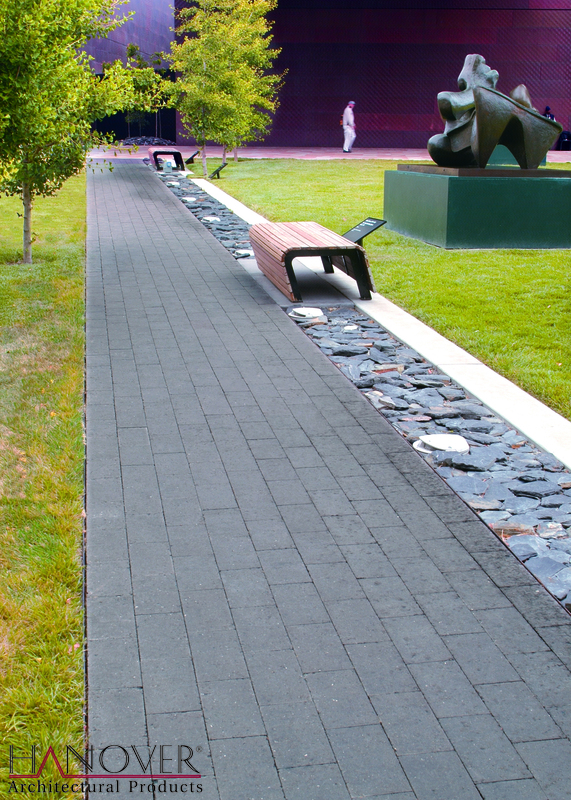 Hanover® has included a SlateFace® paver to its product line. 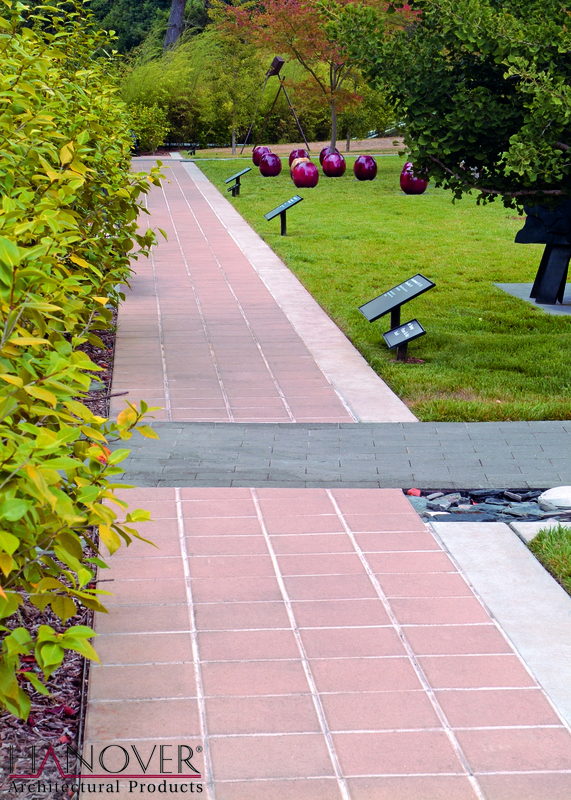 This paver has been designed to reproduce the texture, color and appearance of natural slate. Although custom colors can be produced, these pavers are stocked in Hanover's own BlueStone and Tennesee FlagStone colors. Manufactured in accordance with the requirements set forth in the American Disabilities Act (ADA), Hanover's Detectable Warning® Paver is fabricated with a non-slip texture applied to the surface of the paver. Typical installations include railway platforms, handicap ramps and curb and grade changes. The need for a pervious concrete paving unit that allows water to permeate the soil has become increasingly important. Our municipalities now require that rain and storm water runoff be controlled and retained. Hanover's EcoGrid® and Aqua-Loc® Brick are permeable paving units which manage runoff while allowing moderate vehicular traffic. Hanover's ability to produce precast products that complement Hanover® Pavers creates the opportunity for a completely "finished" project. Each detail can be coordinated. Custom coping, stair treads and risers, wall caps, pedestrian ballards and many other site furnishings can be produced so that the aggregates and colors match or accent within the site. The selection of Hanover's Prest® Brick sizes, colors, and textures allow endless design possibilities. Several Traditional® rectangular pavers and other Multisided shapes compliment each other. An "old world" Appian® paver offers several styles of paving brick to the designer with an irregular top surface to resemble small stone sets. A circle and fan pattern is part of that series, as well as a three piece Mixed pattern. A Tumbled Prest® brick is another design option that creates an old world atmosphere all its own. The worn stone effect will add a warm inviting entrance to any style building or home. Hanover's newest design complimenting the already-existing Prest® Brick line is Serengeti™ Stone. Displaying the rough and rugged characteristics of the Serengeti, this design is generally laid randomly. Concrete modular curbing units are offered in several profiles and sizes. The curbing can easily blend with the pavers and compliment the project. Extremely dense concrete with high compressive strengths gives the units low water absorption rates and salt resistant qualities. The units are consistent in size and many times more durable than poured in place curbing. The concept of using concrete pavers as roof ballast, plaza deck and terrace pavers has created new opportunities for otherwise lost space. Roof and deck pavers can now be functional, as well as attractive when viewed from higher elevations. Hanover® Prest® Pavers provide durability, protection and performance for the roof system from harsh weather conditions. 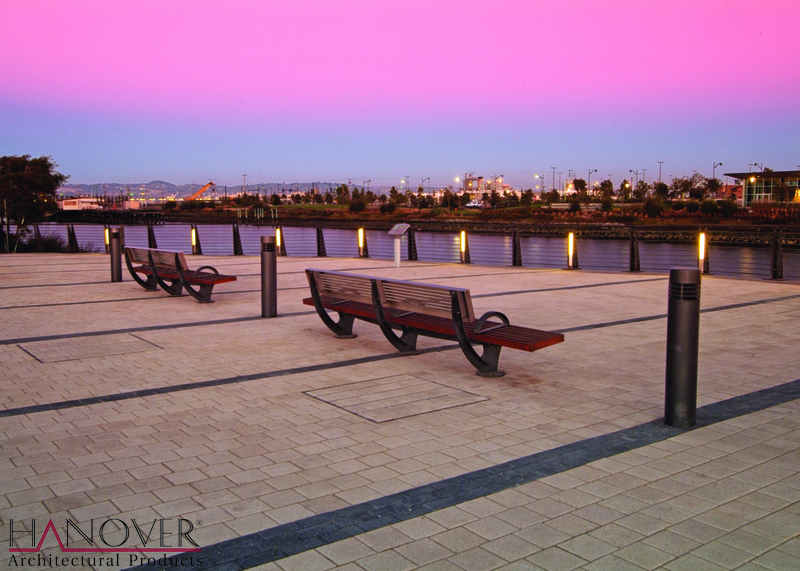 The Hanover® Ventloc® Paver is an extraordinary breakthrough in roof ballast pavers. Ventloc® is the only ballast material which enables the transfer of air pressures. Its patented design offers superior wind uplift resistance in a high quality concrete roof paver. Effectively draining water from a roof or deck is a critical issue to every building. The application of an elevated paver system provides the designer with new possibilities and advantages. Hanover's Roof Pavers and Pedestal Systems make roof and deck plaza areas attractive, serviceable and functional. Hanover® Asphalt Block is a very unique paving alternative which offers many distinctive advantages. Specialized methods of manufacturing enable the production of an extremely dense paver that has the ability to withstand "real world" conditions at their worst. Tests show Asphalt Block to be spark resistant, able to support heavy static loads, have an absorption rating of less than 1%, and hold up with the application of rock salt or mineral oil. Asphalt Block is available in several sizes and variety of colors and textures. They will enhance any project - residential, industrial or commercial.